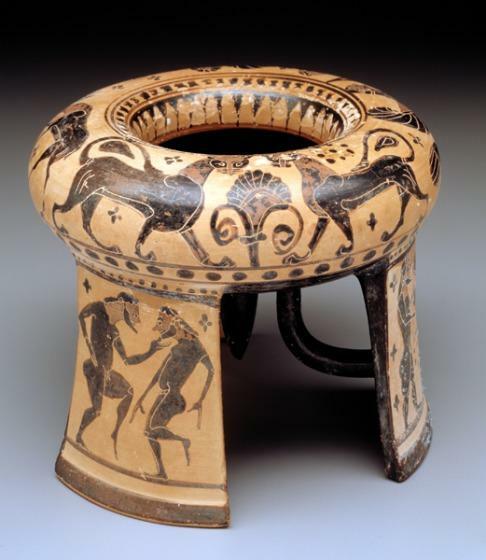 The high level of ceramic manufacture in Greece during the 6th and 5th centuries BCE led to experiments in unusual vase forms. This tripod-shaped kothon shape recalls metalwork tripod vessels, and was designed to hold perfume without spilling. The vessel features scenes of athletes, komasts, or ritual dancers, and drinking companions, as well as decorative geometric animals and patterned ornament. Overall this vessel has a whimsical feel, its energy activated by the lively actions of the figures. 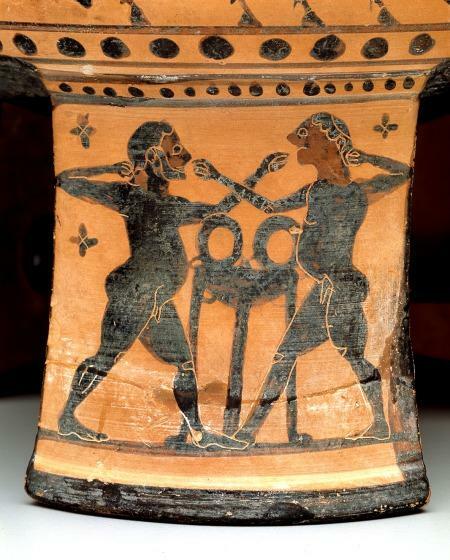 This vase belongs to a series of vessels (many of them tripod-kothons) known as the Boeotian Dancers Group. Choice of figural subjects (especially the frolicking komasts), ornament, vase shape, and the painted style indicate a common workshop for the vases in the Group. Prevailing evidence suggests that the workshop was located in or near Tanagra in southeast Boeotia. Karl Kilinski II, "Boeotian Black-Figure Tripod-Kothon" in Art, Myth, and Culture: Greek Vases from Southern Collections, (New Orleans Museum of Art: Tulane University, 1981), 142.